October 18, 2012 - Panacis is announced that a fully electric Cessna 172 has successfully flown multiple times powered by Panacis’ advanced lithium batteries. The aircraft, designed by Colorado-based Beyond Aviation has been undergoing ground testing and short hop flights for almost a year with increasing range and altitude testing culminating in the recent completion of the entire test plan. “The battery system was delivered more than a year ago to support this program and has been used in their lab tests and all runway tests,” stated Steve Carkner, founder and CTO of Panacis. “The same batteries are still operating the aircraft; we have had no significant issues with the battery system and have seen no degradation in capacity or performance over this long test cycle.” Airborne electric vehicles represent the most challenging environment for energy storage due to the increased need for reliability and lower weight, when compared to the simpler systems employed in electric cars. The power profile of electric aircraft is also more challenging than electric cars due to the extreme temperature variations as the aircraft climbs and the high power requirements during takeoff. The flight testing of the Cessna 172 demonstrates Panacis’ ability to deliver the lightest high power battery systems in a production ready format for applications where weight is critical. Beyond Aviation is a high-energy R&D company dedicated to bringing clean energy solutions to general and commercial aviation. 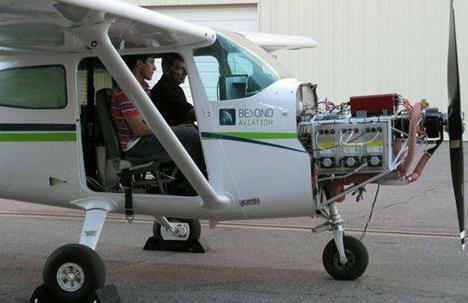 Headed by Charles Johnson, former President of Cessna and former USAF F-105 Fighter Pilot, Beyond Aviation’s goal is to create a revolutionary fully electric powertrain capable of powering aircraft systems of the future without relying on carbon fuels. Panacis designs and manufactures advanced lithium powerpack systems that are safe, reliable, rugged, and scalable. The company has a deep understanding of cell chemistry, electronics, and packaging is trusted by their customers, who have “Impossible Power” requirements that are unmet by conventional products. Panacis’ powerpacks are found in soldier systems, aviation platforms, ground vehicles, medical devices, and off-grid energy storage where other batteries cannot compete. Their patented, breakthrough innovations turn energy storage into a competitive advantage for their customers.